“How do 52 million South Africans share equitably in their 122 million hectares, especially when those hectares vary so enormously in value?” asks the Johannesburg Star. The danger of not getting the answer right was revealed in the Mail and Guardian in an open letter to Richard Branson from Andile Mngxitama, the Economic Freedom Fighters’ (EFF’s) commissar for land and agrarian revolution. He accuses Branson of having bought stolen property: “The consequence of your witting or unwitting participation in this illegal transaction is that the EFF policy of land expropriation without compensation may, in the near future, affect your investment adversely”. Read the full article here. 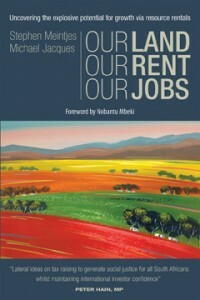 In their new book, Our Land, Our Rent, Our Jobs, Stephen Meintjes and the late Michael Jacques show how a reform of taxation can lead to a more equitable distribution of land, while at the same time stimulating the economy and job growth. As the veteran anti-apartheid campaigner, Peter Hain, comments, it provides “Lateral ideas on tax raising to generate social justice for all South Africans whilst maintaining international investor confidence”. In the Foreword, Nobantu Mbeki writes “This book is, in a sense, immediate and topical and in another, universal and timeless”. Our Land, Our Rent, Our Jobs will be published in July 2015.